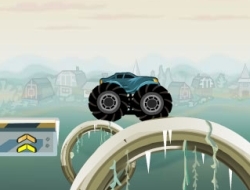 In this great car game you will have to try and reach the end of all nine levels in the shortest time possible. Try not to flip the truck over or it will be destroyed and they are limited. If you lose all of them, then you have to start over. These monster trucks can even be driven underwater so dont be afraid of it. Take care and try not to over use the throttle or some bumps will send you flying and then if you dont land up right the life can easily be lost. At the end of each level there will be yet another obstacle, a platform that goes up and down and it can easily flip you if you dont wait for it and stay right on top of it when it comes from underneat you. Test your driving skills and see if you can complete all nine levels. Extreme Trucks 0.00 between 0 and 10 based on 0 votes.